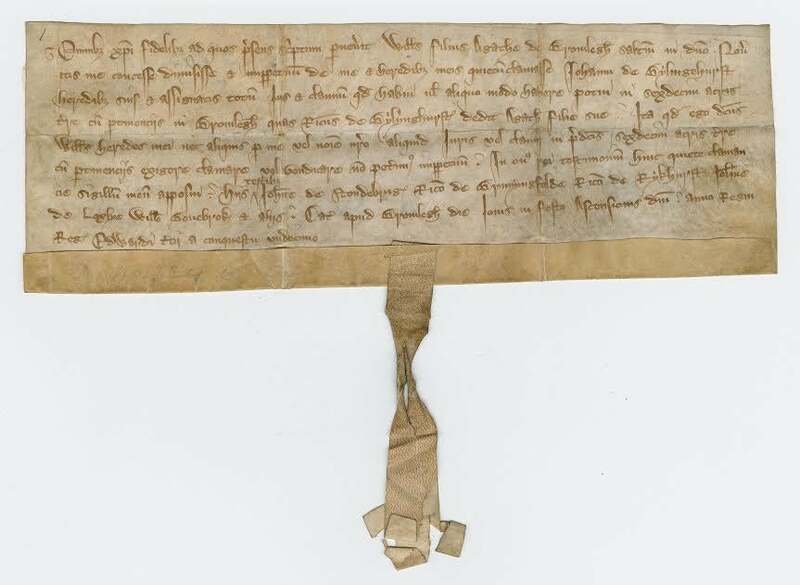 What does this 14-century document say? The item in question dates back to 1337. Dan Hinchen, assistant reference librarian at the Massachusetts Historical Society, was perplexed recently by a discovery he made in the organization’s archives: a vellum — a parchment made from calf skin and used for writing — bearing script that he, at first, believed was Middle English. But in perfect Boston fashion, language experts began stepping forward Friday to respond to a blog post by Hinchen about the item. They offered clues to what language the 14th-century document is in, and theories on what it says. The folder held the 3.5-inch-by-9.5-inch vellum of eight lines of text. On the back was written, “2d Edward III May 27, 1337,” a note apparently added by someone centuries later. The actual text is a dark brown script full of curlicues that looks like it could have come from a Tolkien novel. This one had seemed different, he said. On Friday, Hinchen blogged about his findings on the society’s website, and asked for experts in the field of paleography, the study of ancient writing, to help him decipher the mysterious text, which appears to come from the 14th century. In a center of higher learning like Boston, it wasn’t long before the cavalry arrived. Daniel Donoghue, the John P. Marquand Professor of English at Harvard University, said the writing is likely Latin, not Middle English, based on the photograph provided by the society. But he could understand how it could be deceiving. Eric Weiskott, an assistant professor at Boston College who specializes in the history of the English language and Middle English, wrote on Hinchen’s blog post, and told the Globe, that the document “indeed is from England,” but is 14th-century Latin. Weiskott said Friday afternoon he had been passing around an image of the document to colleagues. Brenda Lawson, director of collections at the Massachusetts Historical Society, said it’s unusual to find documents in the society’s archives as old as the one Hinchen found. But new discoveries are made in the organization’s collections constantly, she said — the society has a trove of millions of documents and manuscripts spanning centuries. Lawson said it’s part of the society’s mission to engage with the public and it welcomes the interest generated by these types of mysteries.